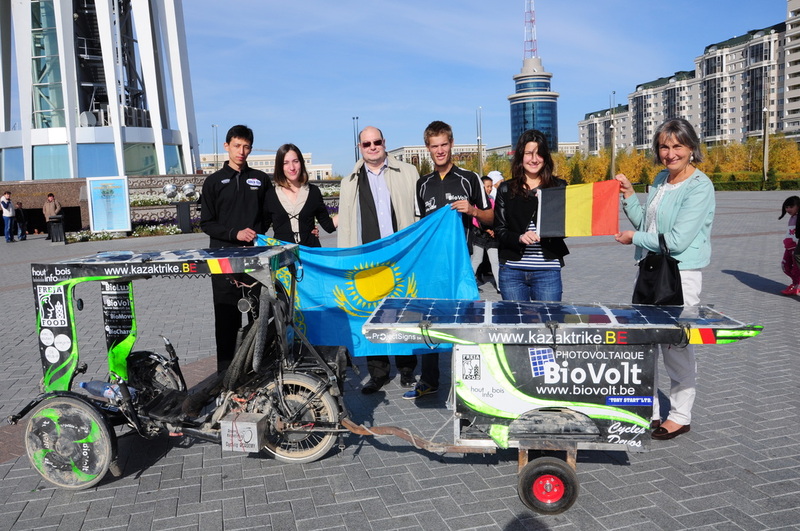 I’m back in Belgium with that Kazak-Trike unforgettable experience of life. 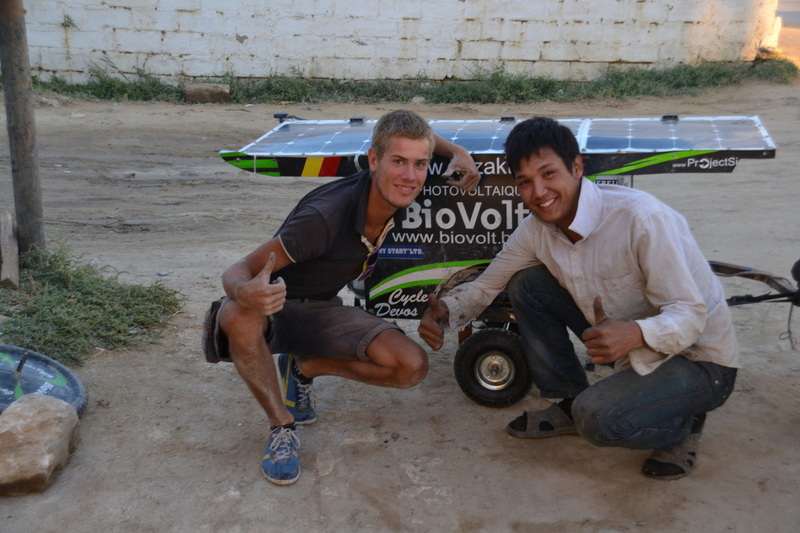 I designed, funded, built and drive my solar-bicycle to discover along the way and inspire people about other way of moving. I’ve to much to tell about this 3 month expedition and the 4th month to came back slowly to Belgium. 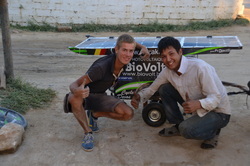 I was following my path to inspire people with my solar trike and being inspired by people I meet along my way. How was my feeling all along the way? How did I cope with the robbery? What did I learn? What was the most important to me? 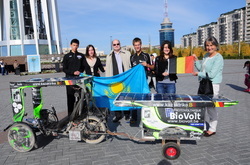 Do you want to know more about my feelings after this adventure... Click on "lire plus"
I'm in Astana. The belgian embassy welcomes me very well. My schedule is already quite full with some interviews and a conference at the Nazerbayev University. When can I rest a bit ?! Visits, discoveries, cycling, mechanical, but when do we eat? when do we rest? But finally we like both! So when Ali is hosting us, it is the best! Program, harvest nuts and gourmet meals. A good rest day. Thank you Ali and the whole family. Now we know from where come all the hazelnuts from Nutella! That's for the big day, for the others, just click on "Read More" ! The sea is flat. Well no! Mechanically, in Turkey, people are always ready to help us. The first problem was the first day after Istanbul, we think the trailer is a little too bouncy... The result was a broken tiller (the attachment arm of the trailer). We're lucky, the photovoltaic panels are saved. There is a guy who helped us with torch and a new steel bar to replace the broken aluminium piece. Here we go again, well, that's without counting fasteners that are too flimsy. We broke one. Then we meet a guy, called the "Profesyonel" (that's how we write professional in Turkish orthography, for once, I make a deliberate spelling mistake) He breaks the second one, thank you! Fortunately, we had spare. A little further we replace the in a garage to avoid having to worry about that. In short, from the basic trailer, there remains almost nothing. I built the structure around an existing database, the structure is holding up well, the base is dead. Conclusion: next time, I do everything myself! With all that, we are back in our mountain passes. We visited lovely cities (Sinop, Zonguldak etc.). We also discovered an improvised shipyard for wooden boats. We have also been to a typical wedding, enjoyed the beaches of the Black Sea and discovered small villages while we stopped for a tea. With mounted, we haven't seen a lot of cyclists. Only a Turkish cyclist and a German couple. We share our breaks with motorbikers.